First, the middle picture personifies Capt. Gregorio “Goyo” Caseñas, the last man who outlasted the battle between the Americans and Filipinos in 1901 at Mt. Verde in Barangay Lonoy. Second, the upper right hand picture shown therein is that of a motorized vessel about to dock at the port of Jagna, the only port in Southern Bohol where vessels ply to and from Mindanao, loading and unloading cargoes and passengers. Third, at the upper left hand corner is a Radar located at the highest peak in Barangay Mayana, where the relay stations of PT&T, GMA 7, SMART & GLOBE Communications and COMMEL are situated. Fourth, at the lower right hand corner is depicting the picture of a manta ray locally called “Sanga”. This seasonal fish specie is abundant in Jagna Sea. And the Fifth, or the last picture, shows a coconut tree and the popular Calamay, a product or delicacy obtained from the coconut fruit: the original Calamay, that is imitated but never been equaled. Adopted because of its beautiful foliage and straight sturdy trunk pointing to the sky which represents the Jagna-anon’s beatiful dream and strong deremination to make Jagna a haven and progressive town to live in. Because of the golden color of its leaves and easy to grow which resembles the golden hearts of the people who are peace loving and charitable. Municipal flower so chosen because of its heart shaped flower which remains fresh for a long period of time symbolizing the ever glowing and loyal nature of its people. A seasonable fish which is caught by the fisherman especially during the summer months. The flesh when eaten as “kinilaw” is so delicious, much more when dried. This pictures the tasteful and noble ideals of the Jagna-anons. which improve the living conditions of its people. Blue color symbolizes purity which also bespeaks of the pure spirit and the noble work done by the government to help improve the living conditions of it people. The jackfruit although thorny emits a very inviting odor which is likened to a young maiden whose fragrance and beauty cannot be hidden and concealed. Because of its beatiful color, its rarity which is now one of the endanged species. This symbolizes the people’s love for the beautiful, especially for the rare and priceless and their true efforts to preserve these things. A Municipal Hymn to be sung in all public occasions when deemed approriate. 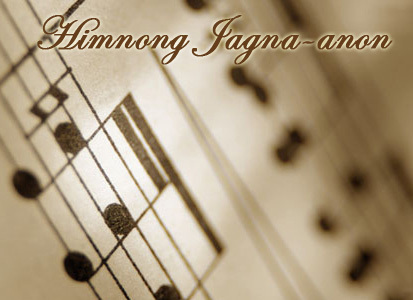 It is entitled “Himnong Jagna-anon” lyrics composed by Mr. Wen Bertumen, the music composed by Mr. Leoncio Gulle (father of Mrs. Eva Gulle de los Santos, an International Pop Song Festival winner held in Finland sometimes in 1990) and interpreted by Rowena Abrau.